How Do You Care for Baby Teeth? As a parent, your job is to introduce good oral health behaviors to your children beginning in infancy. Tooth decay affects more children than any other chronic condition, making regular oral and dental care a must from the beginning of your child’s life. At Orthodontics and Dentistry for Kids we want to share our knowledge on how best to care for your child’s baby teeth. 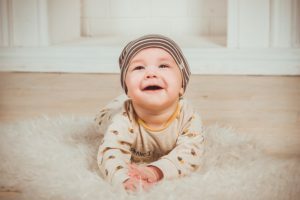 When your baby’s first teeth begin to erupt, you probably don’t think twice about seeing the dentist, however, you should; babies as young as 6 months to 1 year should see the dentist for a brief appointment. A brief first visit to the dentist will ensure that the teeth are coming in healthy and there is no tooth decay. In addition, the dentist can help you learn how to properly brush your baby’s teeth, and get them accustomed to seeing a dentist. The earlier that you and your baby adopt proper oral hygiene habits, the more likely it is that your child will have healthy teeth as they get older, and will not be fearful of future dental visits. Good oral health starts with the habits that parents begin at home with their infants. Before your little one’s teeth appear, you will want to wipe your infant’s gums with a clean, damp cloth twice daily to prevent baby bottle tooth decay, (caused by liquids like milk, formula, and fruit juice) and gum disease. As your infant grows and baby teeth begin to appear, you want to brush them with a small, soft bristle toothbrush and the tiniest bit of toothpaste. In addition to getting your child started on healthy oral habits, you will also need to take your children for their regular dental visits. While there, check with our dental office Jacksonville, FL for recommendations safe for little mouths. When your child is old enough to begin brushing alone, offer assistance in doing it correctly in the morning and before bed. Question About Caring for Baby Teeth? Do you have questions about how to best care for your kid’s baby teeth? Give us a call today at (904) 645-9555! Additionally, if you want to know what to expect on your child’s first visit with us Read More. Are you ready to schedule an appointment? We can't wait for you to see our welcoming pediatric dental office in Jacksonville FL. Schedule your Appointment Today!